Did Crime and Punishment Remake the Novel? Of course, Dostoevsky’s claim to have invented a new literary genre doesn’t solely rest on Crime and Punishment. Although it was published when he was 45, after so many books and setbacks, it marked a breakthrough, not a culmination. Its resemblance to Hamlet resides both in its details (fatherless ex-student, bookish sidekick, philosophy, mumbling, murder) and in its peculiar status, as an extraordinary achievement that also serves as the preparation for a trio of more ambitiously unsettling tragedies. Various touches point towards Dostoevsky’s later novels: a reflection on the “holy fool” (The Idiot), a dream involving a city-wide disease (The Possessed), a smattering of theodicy (The Brothers Karamazov). It is not an insult to Crime and Punishment but a tribute to its author to say that his most famous book, the face he shows to the world, plays a more servile role within his body of work, something like a hinge, or border – a spin-off that doubles as a gateway drug to more exalted highs. What makes Dostoevsky’s characters so real? They aren’t just mouthpieces for the author’s voice. Peter Leithart describes it. Dostoevsky’s polyphonic world is full of free subjects, not objects. We don’t know what they might say or do next, and we suspect that the author doesn’t know either. They speak in their own voices, and Dostoevsky doesn’t drown them out. His voice is only one among many. During the year 1866 only Crime and Punishment was being read, only it was being spoken about by fans of literature, who often complained about the stifling power of the novel and the painful impression it left which caused people with strong nerves to risk illness and forced those with weak nerves to give up reading it altogether. A great novel is 150 years old this year, and readers are talking about it. Prufrock News has collected several links, and the curator, Micah Mattix writes about it for the WSJ. If you don’t have access to the WSJ, here’s a post he wrote on why every Christian should consider reading Dostoevsky’s classic. Is There Beauty in Sodom? Dmitri Karamazov, in the “Confessions of an Ardent Heart in Verse,” rants with great feeling about the two ideals of beauty that haunt the heart of man: the Ideal of Sodom, and the Ideal of Madonna. Dostoevsky expanded on this idea in one of his journals, calling the Ideal of Sodom the “Second Beauty” — the beauty which sin has in the eyes of those who are tempted to commit it. Dostoevsky was criticized, of course, by those who felt that his works sank too far into the darkness without offering any “real” solutions to the problem of human sinfulness. D. H. Lawrence wrote that, “He is like the rat, slithering along in hate, in the shadows, and in order to belong to the light, professing love, all love,” while Freud lamented that “Dostoevsky threw away the chance of becoming a teacher and liberator of humanity; instead he appointed himself as jailer.” Such criticisms are typical of a certain critical tenor that sees literature, and art more generally, as a force for reworking the social order and rewriting the heart of man. It is a critical pose that leads to a kind of puritanism, and it is found just as commonly amongst atheistic reformers as amongst Christians. Melinda Selmys writes about this second beauty and where the incarnation comes in. Thanks to Richard Pearson for pointing out a Times Literary Supplement article on Dickens meeting Dostoevsky. We talked about that meeting a good while back. It appears this story of a meeting of great authors has been repeated by reputable news outlets a few times, while the scholars who should know all there is to know about it say it never happened. This is odd, backwards logic. The hoax wasn’t clever because it convinced so many Dickens scholars; rather, it was clever for the same reason it convinced them: because it was modest. Apparently, Michael Slater’s biography brought this encounter to the attention of book reviewers, which raised it’s profile among scholars of Dostoevsky. Then, the koshka was out of the sumka. But there’s more. If you read Naiman’s lengthy investigation, you will discover that the name of the writer who foisted this mythical story on us is but one pseudonym of many for an independent scholar who could never get hired to a British university. The story of how Naiman tracked him down is incredible and vulgar, but if you want a literary mystery, read this one. Back in April, I posted a note from our friend Dale Nelson, about a record of a meeting between Dostoevsky and Dickens, which showed up in a recent book. Since then a lively discussion has been going on in the comments. A couple different contributors have shown up to question the authenticity of that reference. It appears that the published account lacks corroboration, and there are reasons to doubt whether, although Dostoevsky did visit London in 1862, the two men ever actually spoke to one another. “In the Winter 2002 issue of The Dickensian (vol 98, pp.233-35) we published an article on Dickens and Dostoyevsky which contained remarks apparently made by Dickens in an interview with Dostoyevsky in London in 1862. The occasion was allegedly recalled by Dostoyevsky in a letter of 1878 which was transcribed in a journal cited by the article’s author. Subsequent researchers have so far not been able to locate the journal cited nor indeed to verify that such a journal exists. The author was the unfortunate victim of a very serious road accident some time ago, and is not in a condition to respond to further enquiries on this issue. Mr. Newsom goes on to say, “Michael Slater had previously withdrawn his account of the alleged meeting from the paperback edition of his biography. Thanks to everyone who has participated in this illuminating discussion. 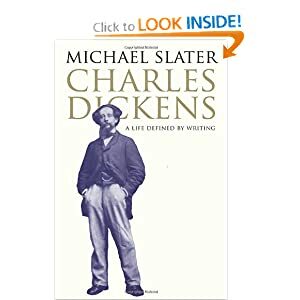 According to Michael Slater’s Charles Dickens: A Life Defined by Writing (2009, p. 502), Dostoevsky talked with Dickens in London at the office of All the Year Round in summer 1862. Dostoevsky wrote about the meeting to Stepan Dimitriyevich Yanovsky in a letter dated 18 July 1878, so 16 years after the event. The letter was translated by Stephanie Harvey in Dickens’s Villains: A Confession and a Suggestion, published in The Dickensian vol. 98 (2002): 233-5. I would be happier if Dostoevsky had written the letter right after the interview. I figure, though, that, at the least, these two did actually meet. That seems wonderful. Update: The story of the Dostoevsky-Dickens meeting is a hoax. See the Comments for more details.